Fully equipped kitchen, oven hob, fridge, microwave, washing machine/tumble drier, and dishwasher. Small utility area, with extra refrigerator, access to conservatory. Large living room 1 dining area - TV and video, wood burning stove. Lobby to front door - coat hooks / boot / shoe storage. 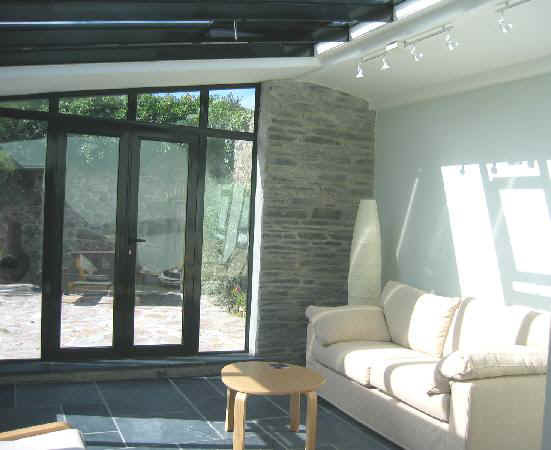 Small secluded garden with beautiful southerly views over Amble Valley and Bodmin Moor. Parking for, two cars secure gates to path and driveway. All linen, towels electricity and gas included in rental cost. Crockery, cutlery, glasses, kitchen utensils, pans, etc. Back door to lobby with LARDER FRIDGE / FREEZER. Video --- a variety of videos are stored in the cupboard. Wood burning stove – logs stored in log basket. Bedroom 1, Bedroom 2 – double beds bedroom 2 with washbasin. Garden parasol – stored in cupboard under stairs – green and white stripes --- base to parasol stored in kitchen / back door lobby --- please put these items away in their relevant places on your departure. Stair gate --- in store room, behind the conservatory. Highchair --- and in store room, behind the conservatory. All bed linen and towels are supplied. Please strip beds prior to departure and place all used linen and towels in laundry baskets. Surfing, swimming etc. 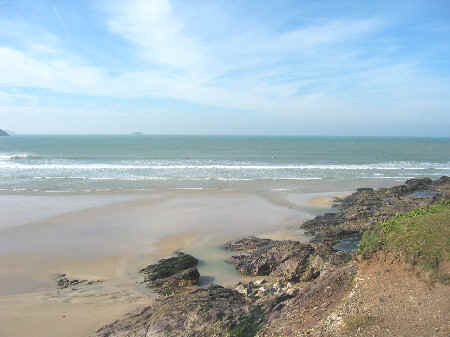 The best local beach for all this stuff is Polzeath -(below) approximately 4 miles from the house. Parking available - all pay and display. Shops - for picnic food - takeaway [cheesy chips! - yummy!] - also for clothes, swim wear, wet suits etc. Advisable to get there early on a good summer's day - gets busy! A lovely safe family beach - lifeguards on beach all day. No dogs, cats or any other wildlife! Cars and personal belongings: baggage and personal belongings are at the hirer's risk at all times. No responsibility can be accepted for loss or damage to cars. We cannot accept liability for injury or loss sustained by any person or for the loss or damage to any property brought onto the premises. Cancellation: if due to unforeseen circumstances you have to cancel your holiday would you please notify us in writing as soon as possible and we will do all we can to re-let the property. If the property is re-let we will refund to you all monies paid. If we cannot re-let the property the balance of the full tariff will have to be paid. Wadebridge Health Centre – opposite Regal Cinema. Lloyds, Midland, Barclays, Nat West. From Exeter, take A30 to Bodmin. From Bodmin take A389 to Wadebridge. Come to large roundabout; Wadebridge to your left; Padstow straight ahead; take right turn to Bude --- A39. After approx. ¾ mile take left turn to Chapel Amble. As you enter Chapel Amble cross bridge then turn right --- up side of `Maltsters ` pub. Follow road to cross roads, straight over, follow road up hill --- 1st house on left – 1 Kitts Hill.